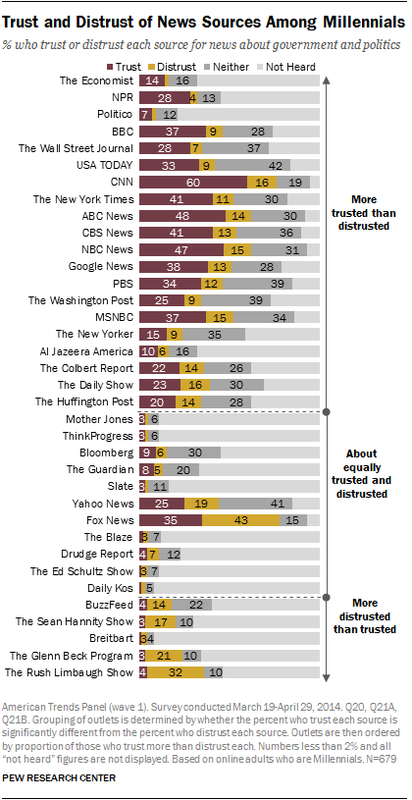 At least as important as where people turn for political news is whose news they trust. Respondents were asked whether they had heard of each of 36 outlets.2 Of the sources they heard of, they were then asked if they trusted or distrusted those sources. Among the sources with which people are familiar, Millennials, Gen Xers and Baby Boomers express, on average, very similar levels of trust and distrust. Each generation trusts roughly four-in-ten of the sources they are familiar with and distrusts about two-in-ten. Because awareness of many of these sources differs both across generation and from one source to the next, the total percent who can weigh in to express their trust or distrust also varies across generations and sources. For example, only 23% of Baby Boomers have heard of Slate, which means that only 23% of Baby Boomers could express whether they trust or distrust Slate. On the other hand, 95% of Baby Boomers have heard of ABC News, which means 95% were able to express whether they trust or distrust it. For this reason, the analysis of trust and distrust of the individual sources considers the relationship of trust to distrust, rather than the total percentages. By this measure, there is a good deal of commonality in trust and distrust of sources across the generations, but there also are some noticeable differences. Because the analysis considers this series of questions in combination, it is important to take the level of awareness of each source into account as substantial differences exist both from source to source and across generations. Millennials, particularly, are less familiar with many sources compared with Gen Xers and Baby Boomers. Thus, the portion that trusts a source is often based on a relatively small share of the generation. It is also important to consider trust levels alongside distrust levels. A source may, for example, have high levels of trust, but nearly just as high levels of distrust. Therefore, much of the analysis of trust and distrust in each generation relies on the balance of trust and distrust. For the total percent within each generation that trusts and distrusts each source, see the sortable table interactive. In total, 14 of the 36 sources are trusted more than distrusted by all three generations – a level of similarity not found in the analysis conducted across political ideologies. Four sources are distrusted more than trusted by all three: The Glenn Beck Program, the Rush Limbaugh Show, the Sean Hannity Show and BuzzFeed. Additionally, seven sources are equally trusted and distrusted by the three generations: Yahoo News, Mother Jones, Slate, ThinkProgress, Bloomberg, Drudge Report and Daily Kos. There are, though, some sources where the balance of trust and distrust differs across generations. Three sources are more trusted by Millennials, but more distrusted among Gen Xers and Baby Boomers: The Daily Show, the Colbert Report (which has recently gone off the air), and Al Jazeera America. Three others are more trusted by Millennials, but have about equal levels of trust and distrust in the other two generations: The New Yorker, Politico, and Huffington Post. All are sources whose audiences are left of center. The only source that elicits more distrust than trust among Millennials but not among Gen Xers or Baby Boomers is Breitbart, a source whose audience falls on the conservative end of the spectrum. 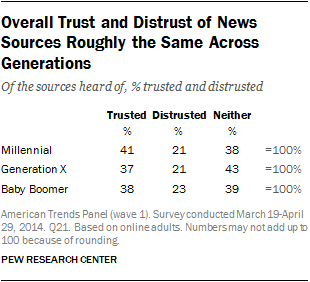 There are also some sources where trust outweighs distrust among the older generations but not among Millennials, including Fox News, The Guardian and The Blaze. Appendix B contains detailed tables showing trust and distrust as well as those who expressed neither sentiment and those who were not familiar with the outlet to begin with. These detailed tables can help put these data in further context. Among Millennials, for example (the table for which is also shown to the right), CNN is known by 95% of Millennials, trusted by 60% and distrusted by 16% (with 19% saying they neither trust nor distrust it). NPR, on the other hand, is known by 45% of Millennials, trusted by 28% and distrusted by 4%. Even though NPR has lower percentages than CNN, Millennials express greater trust than distrust for both. Again, this shows the importance of looking at the relationship of trust to distrust for each source, taking into account differences in awareness.